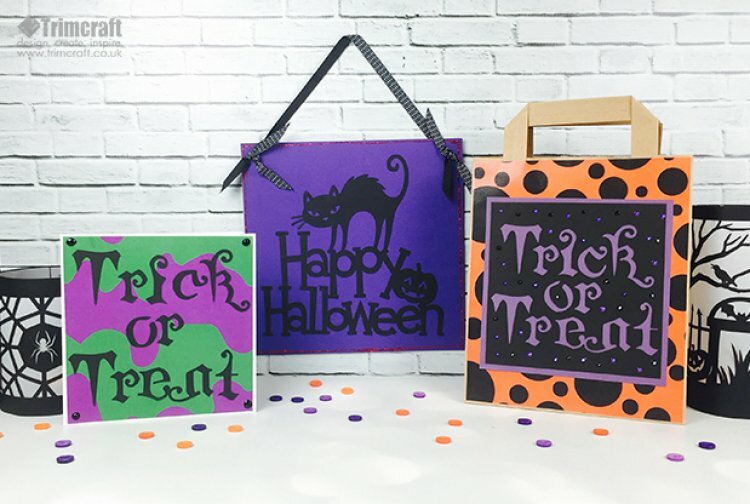 Cricut cutting machines take the hassle out of crafting with intricate designs cut at the touch of a button, we have put together 3 ideas for Halloween crafts. 1. Go to the home page on your Cricut design space; scroll down until you find the lantern design. Cut out using the black card stock and vellum. 2. Adhere the vellum to the cardstock, then allow to dry. 3. Roll the design and join the sides you can try rolling the card around something like a bottle to manipulate the card stock. 4. Use a battery tea light to illuminate the lantern. Top Tip: Battery powered lights are a safe way to add some spooky lighting on the dark nights!. 1. Search Halloween in your Cricut design space to find the Happy Halloween design, cut out using the Dovecraft black card stock. 2. Cover a piece of 21cm square grey board with first edition purple textured card stock. 3. Adhere the Halloween cut out onto the board. 4. Frame a border with the red glitter glue and allow to dry. 5. Punch two holes in the top, thread the ribbon through to hang up the design. 1. Search Halloween on your design space to find the Trick or Treat sign, alter the size to approx 14cm and cut out using the black card stock. 2. Cut a piece of backing paper to fit the bag and adhere to the bag. 3. Cut a piece of purple First Edition card stock to fit behind the sign, allowing a thin border. 4. Adhere to the bag and finish by adding some pearl dots randomly with the pens. Top Tip: Use the leftover letter cut outs to create a matching card, mount them on the free paper printables. Download your free Halloween papers here. We would love to see what you have been making for Halloween, upload and share your spooky party makes in the project gallery.